Hailed on two continents as" infectious" and "the best of contemporary/trad Celticmusic" Ten Strings And A Goat Skin are a bilingual trad/folk/fusion trio, playing Irish, Acadian, French and original creations infused with modern and world rhythms. The band creates a fiery, contagious and unique sound with a stage presence that leaves audiences wanting more at every show. Ten Strings And A Goat Skin both highly respect the traditions of the music they play while riding a wave that is redefining the roots of that music. Their original material maintains solid traditional elements but explores rich world flavours and textures. The results have been described as intoxicating and refreshing. “A seamless, polished, barrel-drum-tight, rhythmically innovative and wildly entertaining traditional music powerhouse.” ( The Guardian-2014) Members of Ten Strings And A Goat Skin, a bilingual band hailing from Prince Edward Island Canada, multiple nominees for the 2013 Canadian Folk Music Awards, East Coast Music Awards and Music PEI Awards, are having the time of their lives as a trad/folk/fusion trio. Weaving the music of the Irish, Acadian, Francophone and Maritime cultures and their original creations with modern and world rhythms, Ten Strings And A Goat Skin have created a fiery, contagious and unique sound that has them in demand and touring extensively throughout Canada, the United States and Europe. Industry heavyweights have referenced the group’s rare musicality that belies the musicians young ages. 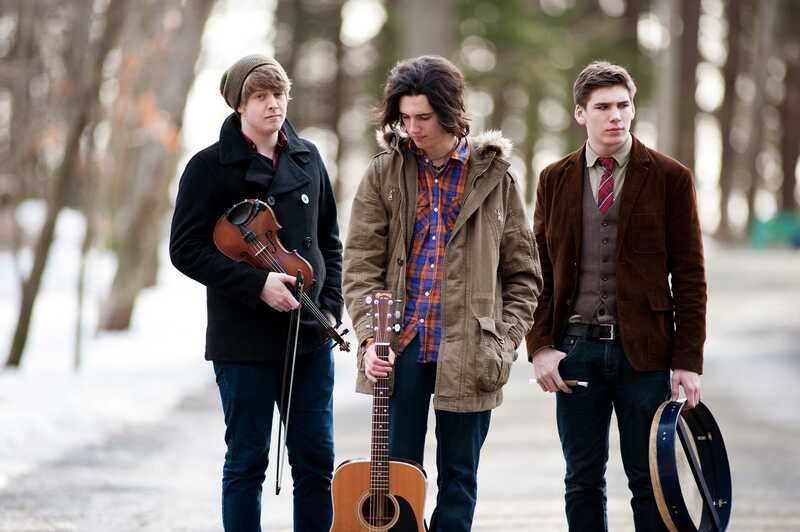 With Caleb Gallant, 18 years, as percussionist, Rowen, violinist, and Jesse, guitarist, at aged 20, the lads are pushing boundaries and reinvigorating timeless traditional music for the 21st century. The group’s creativity and unique style has not gone unnoticed. In a recent review of the group, London England’s “Kreol International Magazine” made the following observation: “One of the greatest features of the music industry is the ability for any band from any corner of the globe to achieve widespread notoriety and success. No matter where a band comes from or what kind of music it performs, it is possible for the band to garner attention and gain fans from across the globe. What makes music even more special is the ability for particular groups to succeed while defining their own genre. In a way Ten Strings And A Goat Skin is the perfect example.” A recent Trad Magazine France feature article (issue 157 Sept/Oct 2014) on the group called them “Une Vent Frais et Novateur de Ille de Prince Eduard”. [ A Fresh And Innovative Wind From Prince Edward Island] Jesse, Rowen and Caleb highly respect the traditions of the music they play but are riding the wave that is redefining the roots of that music. Their original material maintains solid traditional elements but explores rich world flavours and textures. The results have been described as intoxicating and refreshing and recently, a music industry professional, directed to see the group, stated the sentiment, “I don't like Trad but I love this!” By both French and English audiences, the trio is humbled by the huge reaction they have received towards their music. They just as easily connect with the indie music crowd as they do with the traditionalist and notably, their fan base carries no age barrier so including children to seniors and those in between. A recent article in Marque Wire Magazine from Milwaukee, Wisconsin reviewed the boys performance at Summerfest (the biggest music festival in the world) saying that while groups like Bruno Mars and Motley Crue were amazing, other smaller acts like Ten Strings And A Goat Skin (referred to as “a gem”) were every bit as good. All three band members are proudly Canadian by birth but their roots stretch across the globe. Rowan and Caleb are natives of Prince Edward Island on Canada’s eastern coastline. Their root’s encompass Acadian, Irish, Scottish, and English heritage and were fortunate to grow up at time of French/Acadien cultural/language resurgence. Jesse grew up on Prince Edward Island but was born in Canada’s only remaining French province, Quebec, and so grew up in a bilingual home with French education. The members of Ten Strings And A Goat Skin believe their cultural backgrounds has allowed them to appeal to a wider range of music lovers. From humble beginnings came the music of Ten Strings And A Goat Skin with a first performance at a community fundraiser to paint the local parish church in Rustico, PEI. Not having a band name to introduce the boys, a family friend took stock of the instruments and suggested the name that has served them well. They’ve never looked back and the church got painted. The year of 2014 has seen the group perform at major Canadian and International festivals and theatres as well as many wonderful smaller venues. They have had the privilege, in a very short music career, to perform in some of the worlds premiere festivals including Festival Interceltique de L’orient (France), which included stadium shows to over 75,000 people, the Philadelphia Folk Festival, considered the Granddaddy of folk festivals , Festival International de Lafayette, Rythym and Roots Festival, Winterlude (Ottawa), Artsplosure, Raleigh, and Summerfest (Milwaukee.) In addition to live shows, the group has recently performed in television and radio productions. In September 2014 a new Canadian national television production “Balade a Toronto”, which highlights rising stars in Canadian Music, featured its premier show with Ten Strings And A Goat Skin, they were presented on TV5 France to an audience of 4 million as part of the Festival Interceltique de L’orient and In addition, they were featured on the Canadian Broadcasting Corporation (CBC) nationally televised Canada Day show. The trio has enjoyed numerous interviews on radio, locally, nationally and internationally. With it’s latest album, “Corbeau”, Ten Strings And A Goat Skin has received wonderful reviews and multiple award nominations. A UK FolkWorld music review states, “Corbeau is one of the top trad albums of 2013. Fetch a copy”, and suggest that the group relates to the British Group Lau or the Irish American Group Solas. Trad Magazine (France) has been hugely complimentary. In addition, the groups album has been listed on numerous top ten folk album list at year end 2013. The opportunities presented to the trio have been tremendous. They have been fortunate and their hard work and commitment to the music is being noted all over. Playing such prestigious festivals as the Philadelphia Folk Festival is very exciting and the venues have been very generous . A comment from a senior industry player serves as a testament to what the group has been able to achieve in short order. “Several of our programming committee saw Ten Strings And A Goat Skin at various Canadian events in the last year. We agreed, unanimously, that they represented the best of the contemporary/traditional Celtic music, and booked them for our 2014 Festival.” Jesse Lundy – Point Entertainment, co-artistic director Philadelphia Folk Festival The group Ten Strings And A Goat Skin, who are as happy at a local irish session or fiddle camp as they are on a main stage, are very excited about the future and their music. The spirit of the tradition is in good hands with Ten Strings And A Goat Skin. The name almost sounds like a children’s book to read to my niece sometime, but it’s truth in advertising. Combine guitar, violin and bodhran and you’ve got just what this trio promises. Then add banjo and stray percussion. Strictly speaking, it’s twenty-odd strings, a couple drums, a goat skin/tipper and some vocal cords here—and that’s not counting the guest cast—but they’re really enough of a mouthful already. Whatever you call it, the result is a rollicking listen that feels over too quickly. The trio shows the colors of their native Prince Edward Island as vibrantly as Scotland or Ireland. Après du Poêle means “around the wood stove” (referring to the communal experience of gathering for warmth in winter). A few lively reels show those cozy roots here, but more than half the album is written by the band themselves. Clearly they’re interested in the other vital half of the folk tradition: expanding the custom as much as maintaining it. Ten Strings and a Goat Skin have received more Canadian Folk Music Award 2016 nominations than any other band in the country. The group is nominated in three categories and member Rowen Gallant is up for best traditional singer of 2016. The bilingual trio of Jesse Périard, Caleb Gallant and Rowen Gallant call Rustico, P.E.I., home and describe themselves an "acoustic power trio" with roots in P.E.I. 's traditional celtic and Acadian music. "We all got together and gave a big old high five and group hug!" said Périard of receiving the news of the band's nominations. "We still can't really get over it! … Huge surprise to us." “Hello everybody, welcome to the Trailside for our first night of the season,” said Trailside Café co-owner/operator Pat Deighan as he greeted the sold-out crowd last Friday evening in Mount Stewart. “Please put your hands together for Ten Strings and a Goat Skin,” he added as applause rose up to greet the three young men who were winding their way through the tables to the stage. The café had apparently broken the record for the number of meals sold at one show that night, and with many of the crowd members still eating, they were about to enjoy their food and live music simultaneously. “We’re so happy to be here for the opening night of the Trailside!” said the percussionist for the trio, Caleb Gallant, as they took their places on the rustic-wood-framed stage in the corner of the room. “And, it’s our fiddler Rowen Gallant’s twenty-first birthday tonight.” The crowd cheered as Gallant quipped, “It’s now gonna be a lot easier to rent cars in the States.” Diving into an intense groove right off the bat, the trio began with a Scandinavian-flaired set of tunes, as darting fiddle melodies and driving guitar rhythms and pounding drum beats soared about the candlelit dining room. It was an immediate example of the reasons behind the group’s recent 2015 ECMA for world music recording of the year at the ECMAs in Newfoundland in April. And now that the educational pursuits have reached their end for guitarist Jesse Périard (who just graduated from the SOPA program at Holland College) and for percussionist Caleb Gallant (who just graduated from the music business program at NSCC), it’s clear that Ten Strings and a Goat Skin is going to be even more of a force to be reckoned with, as touring and recording will become their primary focus for the band’s future. The night continued with even more rollicking highlight numbers like Parlez-Nous À Boire, The Night They Moved the House and The Byzantine Reels - in which the band’s now signature creative rhythm work danced ferociously about (with zinging offbeat strikes galore) with precision and flare that fueled their performance in every tune. Kicking out some hilarious off-the-wall humour in between songs, too, with a playfulness that carries over into fiery medleys and engaging vocal numbers, Ten Strings and a Goat Skin are clearly hitting at the top of their game at this point. And the crowd hung on every note right to their encore and standing ovation at the Trailside that night. The trio seems especially pumped to now start into a packed season ahead of touring, as they are gearing up for shows in both French and English that will take them around Canada, to the U.S., the U.K., France, Belgium, Switzerland and Denmark. But the next big performance by Ten Strings and a Goat Skin will be at Toronto’s Roy Thomson Hall, for the Live on the Patio Summer Series on May 12. You can also catch them back on the Island during Music P.E.I.’s May Run Music Festival on May 15 at Harmony House and the Olde Dublin Pub. For more on the exciting times at hand and ahead this year for Ten Strings and a Goat Skin, check out www.tenstringsandagoatskin.com. No singular location outside of New Orleans or Chicago can be said to celebrate traditional music perhaps more than southern Rhode Island. The coastal swath spanning Newport to Charlestown hosts well known summer music festivals that feature North-American born musical traditions that include bluegrass, folk, jazz, blues, Cajun, zydeco, R&B, country and rock n’ roll. This year Wentworth has booked several tradition-bending (and blending) performers never before heard in New England, and plans to introduce his loyal audience to exceptional Canadian artists in a special opening night tribute. On Friday, August 29, the live performances kick off at 4 p.m. with three blistering stages of genre-blazing music in three diverse themes. The Canadian Stage will feature a special tribute to outstanding north-of-the-border performers, and is hosted by Leonard Polodak of The Duhks (Polodak’s band is hosting the festival and is often described as playing “progressive soul-grass. )” Other celebrated Canadian artists to take the stage include blues sensation Matt Andersen, and the folksy, award-winning Ten Strings and a Goat Skin. The gritty, bluesy 24th Street Wailers will also take the stage, and may very well rockabilly your socks off. Walk across the Ninigret grass, and hear Rhode Island native – and now Nashville mainstay – Sarah Potenza as she hosts the Americana Stage, and sets off a rough and ready, country-colored night of music that features traditional bluegrass artists the Travelin’ McCourys and Grand Ole Opry outlaw (and “It Takes Balls to be a Woman” songwriter) Elizabeth Cook. Festival attendees have the chance to ‘hit a triple’ on Friday if they also venture over to the Dance Stage where artists like the energetic Pine Leaf Boys, world-renowned Steve Riley and the Mamou Playboys and others help everyone to move their feet, dishing up the Louisiana-syled heat. The DiscoverLouisiana.org (LACVB) folks are sponsoring this purple-floored, tented dance party where everyone can get on their groove on until the clock strikes midnight. It is also notable how many festival musicians have actual family heritage influencing their sound. The Canadian Masters of the Fiddle, featured on Saturday, are a blending (and married) union of two great musical families. Natalie MacMaster and Donnell Leahy are both internationally recognized as fiddlers and serve up a lightning fast, Celtic-meets- Cape Breton Island playing style that comes along with equally fast step dancing and very special guests. Also on Saturday, you can catch the sizzling Zydeco “prince” C.J. Chenier who in January accepted a Lifetime Grammy Award in honor of his late father Clifton Chenier, known as the King of Zydeco. There are many other notables in the lineup over playing on Saturday and Sunday too, including the legendary jam band Leftover Salmon and fan-favorite Donna the Buffalo, who will be celebrating a 25-year anniversary all weekend. For more information and tickets you can visit their website, www.rhythmandroots.com. This year’s Summerfest was definitely one for the history books. While the big name headlining acts such as Outkast, Bruno Mars, Fall Out Boy, and Mötley Crüe were surely amazing, the fest brought in some smaller acts to the grounds that were just as good (and much less expensive). One of those gems was the Canadian folk trio, Ten Strings and A Goatskin, who played the U.S Cellular Stage on July 3rd. For those who are unfamiliar, the band is comprised of guitarist Jesse Periard, drummer Caleb Gallant, and singer/violinist Rowen Gallant. Their music is influenced by Irish, Francophone and Maritime cultures, and combines modern and world rhythms with traditional & original tunes, creating an energetic and unique sound that’ll grab your attention and make you want to clap along to the beat. The bilingual trio started their set with some toe-tapping instrumental tunes and followed with a soulful performance of “Parlez-nous à boire,” which just so happens to be all in French. And if the French wasn’t enough to win you over, then the boys’ simple charm, warm smiles, and love and passion for folk music would. Ten Strings is extremely talented. All three members bring their own flare to the stage and Rowen’s expert violin playing and boisterous voice are what give Ten Strings their signature sound. Other songs on their setlist included “The Night They Moved the House” from their most recent record Corbeau and an incredibly fast paced folk rendition of Lorde’s hit “Team” (which I actually prefer over the original track). If you’re a fan of folk music or just feel like doing an Irish Jig, Ten Strings and A Goatskin are worth giving a listen to. Their music will leave you feeling energized, fired up, and wanting more. Ten Strings & A Goat Skin "Corbeau"
Ten Strings & A Goat Skin are Rowen Gallant, Jesse Pèriard and Caleb Gallant, and they play - guess what? - fiddle, guitar and bodhrán. Their second album, nominated for but unfortunatly not awarded with two 2013 Canadian Folk Music Awards, is a vivacious mix of the Irish/Scottish and French traditions of the East Canadian province of Prince Edward Island. Deeply rooted in traditional music, they have a jazzy approach though, and relate to contemporary trad groups such as the British LAU or the Irish-American Solas. The fiddle-led music is lively and will get you on your feet. The starting "Huginn & Muninn" (the pair of ravens from Norse mythology, the French album's title means raven) by Rowan Gallant is one of the cool tunes written by the band members. This is complemented with melodies from the Quebecois tradition and Simon Jeffes' groovy "Music for a Found Harmonium". The trio is obviously fond of modern Celtic music, there are two tunes from Irish fusion band Kila: their piper Eoin Dillon's "Liffey Reels" and their fiddler Deirdre Armstrong's "Fir Bolg". Songs featured are Cyril Tawney's "Grey Funnel Line", an animated version driven by Jesse Pèriard's rhythmic guitar, "The Night They Moved the House" from local legend and singer/songwriter Lennie Gallant, and a drinking song from the Cajun tradition, "Parlez-Nous À Boire" (Tell Us To Drink). "Corbeau" is one of the top trad albums of 2013, fetch a copy, catch the trio in concert, or pay a visit to the Old Triangle Alehouse in Charlottetown, Prince Edward Island, where Ten Strings & A Goat Skin reportedly are part of the Sunday session players. Please check back soon for Ten Strings And A Goat Skin's tour schedule.